USA’s Nathan Chen performs his Free Skate at the 2019 World Figure Skating Championships. 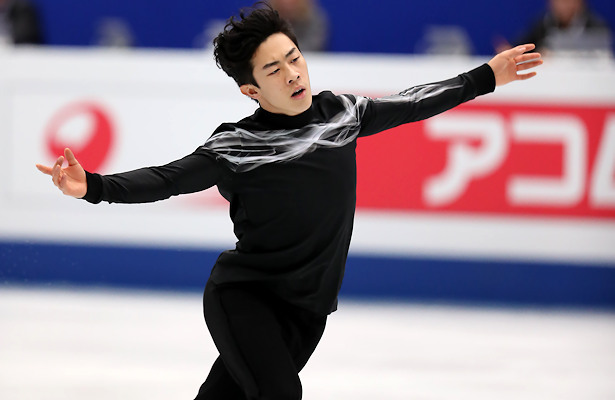 USA’s Nathan Chen defended his title in the Men’s event at the 2019 World Figure Skating Championships on in Saitama, Japan on Saturday night. Two-time Olympic champion Yuzuru Hanyu of Japan moved up from fourth place to take the silver—his sixth world medal, while USA’s Vincent Zhou earned the bronze in his second appearance at this event. Last to skate, Chen had to perform right after crowd-favorite Hanyu laid down a brilliant free skate. Chen was flawless in his powerful routine to “Land Of All” by Woodkid which featured four clean quads: Lutz, flip, toe, and quad toe-triple toe. The 2018-19 Grand Prix Final champion also nailed all triple jumps, including a triple Axel and earned a level 4 on spins and footwork, racking up may positive grades of execution (GOE) along the way. He earned a record-breaking Free Skate score of 216.02 and maintained first overall with another record Total score of 323.42. When asked about the Beijing Olympics in 2020, Chen noted that is around the corner. The only error Hanyu made in his dynamic routine to “Art On Ice” was underrotating a quad Salchow. The 2017 World champion otherwise produced a quad loop, quad toe, and quad toe-triple Axel sequence. His triple jumps were solid and he earned a level four on all spins while the footwork was a level 3. He scored a new season’s best of 206.10 for second place in the free skate and moved up from third to second overall (300.97). The 2018 Rostelecom Cup and Grand Prix Helsinki champion does not currently have a plan for next season, much less the 2020 Olympics. Zhou, who was 14th last year in his World debut, left it all out on the ice with his dramatic routine to music from Crouching Tiger, Hidden Dragon. The 2019 Four Continents bronze medalist underrotated a quad toe and the back end of a triple Lutz-Euler-triple flip, but was otherwise solid, landing a quad Lutz-triple toe and quad Salchow. All spins were graded a level 4 and he also scored a new season’s best of 186.99, placing third in the free skate and overall (281.16). Boyang Jin of China moved up four places to fifth overall (262.71) after finishing fifth (178.45) in the free skate to music from the Hable Con Ella soundtrack. The Four Continents silver landed a quad Lutz, but underrotated A quad toe in combination with a double toe and later stepped out of a solo quad toe. He was otherwise clean, landing a total of six triples while displaying level 4 spins throughout. Russia’s Mikhail Kolyada, who has been struggling this season, placed sixth with a new season’s best (178.21) with his “Carmen” free skate, and moved up from 10th to sixth overall (262.44). The defending bronze medalist landed a quad toe-triple toe, but stepped out of a solo quad toe and later received an edge call on a triple flip. He otherwise landed a total of five solid jumps and earned a level 4 on two of his spins. The Russian silver medalist said it was hard to prepare for the free skate after a disappointing short program, but managed to take the ice with a clear mind. Italian national silver medalist Matteo Rizzo finished 10th (164.29) in the free skate after falling on his opening quad. While he had to hang on to a triple Axel, he was otherwise solid, landing a eight triple jumps total, while showing level 4 spins throughout his routine to a Queen medley. With a total score of 257.66, the 2019 European bronze medalist slipped from fifth to seventh overall. The skater said that since his move to work with Rafael Arutyunyan, the environment has helped motivate him in practice and feels that his skating has greatly improved. “I became more confident,” said the skater who will turn 30 next week. “I am definitely going to take a break, I need it. I am not sure if I am going to keep going, Rafael really wants me to. If my body can take it, if my mind is ready for it, and if it is completely on the ice and prepared to work, then I will keep going. If there is even a little bit of a doubt in my mind, or my body is not working the way that it needs to, I don’t think I am going to continue. Everyone wants to finish with a great performance. USA’s Jason Brown, who stood in second after the short, took a fall on a quad Salchow, and finished 14th (157.34) in the free skate. With a total score of 254.15, he placed ninth overall. Andrei Lazukin of Russia rounded out the top 10 (248.74) in his debut at this event.